Protect your employees and property from forklift accidents with KABTech heavy duty industrial safety barriers and barrier rails. KABTech’s unique safety barrier rail design is engineered for strength and durability at an affordable price. All safety barrier guard rails are constructed of high-strength ASTM A-36 structural steel, providing the added forklift barrier safety that cold-rolled steel products just can’t deliver. Warehouse barriers are essential to protect your mezzanines and in-plant office space as well as product conveyors and production machinery from forklift damage or loss. Every safety barrier rail system that KABTech offers comes with easy to read instructions and all the base plate and mounting hardware you need to get the job done right. KABTech’s universal posts and modular design make it easy to configure our industrial barrier rails to your work space. Standardized guard rail components can be arranged in any direction and barrier rail lengths can be cut down or reconfigured should your space requirements change in the future. KABTech can also provide factory-trained installers to help with the set-up and install process. KABTech has professional designers that are ready to assist you with questions and concerns about your forklift barrier project requirements. They will facilitate the order process and provide essential product assistance for choosing economic and integral warehouse safety barrier systems that are custom selected for your industrial safety needs. KABTech barrier rails come in a high visibility bright safety yellow finish which makes them easy to see and provides a visual alert to forklift and other product transport device operators. This ensures the protection of structural mezzanine systems, in-plant offices, and conveyors as well as plant equipment and personnel. KABTech forklift barrier rails are superior to standard OSHA required safety barrier rails. Available in many configurations including single, double, and triple rail applications. 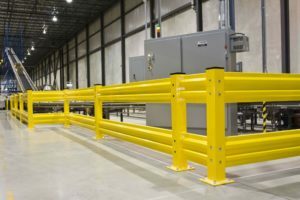 You can specify lift-out guard rails for an easy drive through access to equipment and machinery on the opposite side of your barrier rail system. Safety barrier rail posts can also be outfitted with flared end attachments to deflect head-on impacts, and base plates for aisle ends or entrance openings in the rail at no additional cost. Ask for more information about modified forklift safety barrier rails and end posts. Learn more about our safety yellow Steel Bollards and Column Guard Protectors for additional protection of mezzanine supports, in plant office units, cage enclosures, industrial machinery or anything that can be damaged by forklifts or heave machinery devices. Protect your valuable equipment or in-plant buildings and eliminate employee dangers with a custom forklift safety rail system today. KABTech’s warehouse barriers and forklift safety rails maintain protection for your employees, facilities, machinery and products year after year with lasting integrity. High traffic areas like shipping & receiving offices and facility passageways need to be protected from forklift mishaps. Barrier rails can provide this protection and save you money with the accident they will prevent. We are your single source for all of your office space and warehouse floor space modifications and safety requirements. We offer a variety of modular construction products to upgrade your facility for maximum use of square footage. KABTech also offers a variety of safety rail systems to protect your warehouse personnel who work in close proximity of machinery, conveyors, lifts and elevated mezzanine platforms and outside, raised industrial platforms. We provide a variety of mezzanine safety railings and safety barriers for stairways and landings as well as in plant offices to ensure proper employee protection at all times. We also have a large variety if wire mesh partitions and industrial screen enclosures to effectively protect products and machinery against theft and loss due to damage. Security cages are an economical way to secure and protect goods against unauthorized personnel access. Adding forklift barriers will ensure lasting protection to your security cages and prevent many forklift accidents. Modular in-plant office systems will provide your employees with a more productive and less distracting working environment. Affordable in plant office systems put your management team closer to the production system work area while maintaining a safe and environmentally controlled work facility. KABTech’s elevated mezzanines provide needed work space over existing work areas and machinery and can be designed for open floor production space, storage and goods handling and can even provide additional mezzanine In-Plant office space. KABTech is ready to help you with all of your warehouse modifications and forklift safety rail projects. Contact us today for a free quote.